The Mark Chesler Library Collection connects the university community to more than 1200 books, films, and journals on a wide range of topics related to social identity, multiculturalism, intergroup relations, and social justice. Useful for conducting independent research, enhancing curricular content, or simply broadening horizons, materials are available for use to the entire university community and are listed in the U-M Library System's MIRLYN catalog. The collection is located in Room 232 of The Program on Intergroup Relations office, 1214. S. University Ave, 2nd Floor, Suite B, and is open Monday-Friday 9am-5pm. NOTE: Books at the Mark Chesler Library are NOT available for check out. This will be a RESOURCE ONLY library. 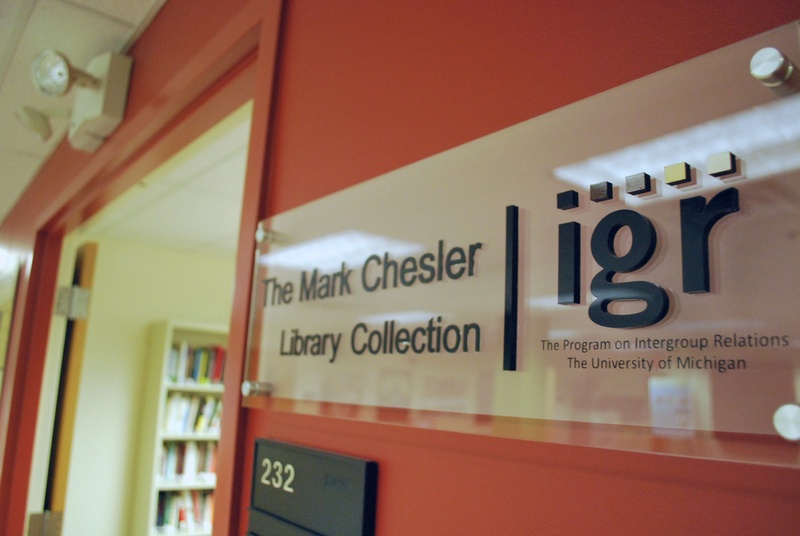 The library collection of The Program on Intergroup Relations (IGR) is named in honor of Mark Chesler, Professor of Sociology Emeritus. Dr. Chesler is one of the founders of IGR. His professional and personal life exemplify IGR's mission "to pursue social justice through education." View the library collection development policy. We welcome suggestions for purchasing new items for the library. Please submit your request using the online purchase form. If you have any questions or concerns about IGR's Mark Chesler Library Collection, please email IGR.MarkCheslerLibrary@umich.edu.